After that are MULTI - DIMENSIONAL LINKS to experience 3-D Tours, Photos, Videos, Maps, Bible References, Food Recipes and additional interesting information. Fig. 1. Mary visits her cousin Elizabeth while both are pregnant. They praise and thank God for the miracle of their babies. Joseph moves over to Mary to comfort her. I tie the necks of the water jugs together and pull them over the donkey’s back. We return to the stable cave to give two jugs filled with water to Joseph and Mary. Then, I tie up eight empty jugs from the stable and put them over the donkey’s back and to lead it to the town’s water wells. My Father said these wells are named for King David whom legend tells us actually dug these wells when he was a shepherd boy here. Fig. 2. King David's Wells - in Bethlehem today. The donkey drinks the water from the well’s run-off. Meanwhile, I fill the water jugs and again load and tie them on the donkey’s back. No one is at the wells at mid-afternoon so my tasks go very quickly. Soon, we leave for the Inn’s courtyard stable. Once there, I make sure all the animals have water and feed in their mangers. Also, they need enough slack in their tie ropes to give them room to lay down. Next, I sweep the areas and bring some fresh straw for the ground. As we leave, I tie the courtyard’s gate to secure it. The donkey and I walk quickly down the hill toward our caves still with two jugs filled with water. Surprisingly, their donkey has been very cooperative, not stubborn as some can be. I like this donkey. As I look closer, I see it has the features of a Syrian-bred donkey that is popular in Galilee. It’s a strong and docile donkey bred for setting a smooth gait which makes riding more comfortable. Hopefully, Mary’s long, hard journey to Bethlehem was made a little easier riding it. Fig. 3. Photo of Middle-East donkey. By the time I arrive at the lower stable cave, Mom already returned to our home. Having finished cooking at the Inn, she’s gathering our few dishes and cups for dinner. She walks next door to set the dishes on the small work table Joseph places on the ground close to Mary. Yea! Soon we’ll eat! I hurriedly tie up the donkey to the stable fence and bring in the two extra jugs of water. She announces proudly, “Tonight’s meal is a special treat. Since some of the Inn’s guests are influential people, the innkeeper decided to purchase a young sheep for this evening’s meal. He had our Rabbi supervise the butcher as he prepared the lamb according to the kosher rules. The butcher roasted it all day in his own fire pit. Then the innkeeper had me add some of the roasted lamb meat to my vegetable stew for everyone at the Inn and for us.” We all happily bless the innkeeper and his wife. For our meal, Mom infuses her special spices and simmers everything in the kettle that hangs over the fire pit outside our home. Mom also made fresh bread that is still warm and really smells good. Mom is a great cook! Fig. 4. Pottery & wooden dishes used in Jesus’ time. Our customs for a weekday meal are not as strict as for our Sabbath meal. So, we are starting our meal this late afternoon rather than at sundown. After the ritual of washing our hands, we recline around the table. Our custom is to begin with prayers over a cup of wine. However, we can’t afford wine, so instead we can only serve water to our guests. Mom serves the bread, vegetables, and meat stew. We pass it around the table and eat with great joy. Joseph is really hungry after their long trip and his repair work, so he eats heartily. Fig. 5. Jewish family meal. Mary only drinks water and some broth from the stew; she has no appetite right now. Mom encourages her to keep up her strength for the baby will be born tonight. While Mom nurses Isaac, Sarah and I eat our tasty dinner with our youthful appetites. God provides plenty of food tonight. We are excited to have these two visitors join our meal. We want to hear all about their adventures in travelling from the hillsides of Nazareth to the hills of Bethlehem in Judea. So I ask Joseph to tell us about their trip. Fig. 6. Joseph and Mary travel to Bethlehem. “Finally we reached Jericho and then slowly journeyed up the steep hills to reach Jerusalem, 3,400 feet up and a distance of 15 miles. We are fascinated by Joseph’s description of their trip. What an adventure! I would love to travel. Our Jewish custom at meals is to set apart some time to encourage children in their faith. Today, Joseph decides to translate for us the meanings of our names. Isaac just giggles and laughs. Sarah and I nod to each other in amazement how good Joseph’s teaching is. I am so overwhelmed by what he just told us I can barely speak. “Thank you. And I love you both,” is all I can say. I want to ask him what their baby’s name would be if it is a girl. But I feel very uneasy to do that. I’m not sure why; perhaps it is because Joseph says the name “Jesus” with such confidence. However, Mom does not ask either. So, I think it best for me to skip my question for now. We sing some psalms and are having such a good time that we forget how late it is – it’s twilight outside now, and Mary looks tired. Joseph notices and ends the meal quickly with our prayer of thanksgiving. He adds a blessing for Mary and the delivery of her child. Fig. 7. A typical inn (in the Middle-East during Jesus’ time) with buildings arranged around a courtyard. Isaac already is asleep at Mom’s side. My stomach feels full from the delicious meal and I am exhausted from a busy day. I don’t need any more encouragement to leave. Tomorrow will be a busy day because the Inn’s guests will leave to return home after their registration for the Census. I will be needed to prepare all the animals for their journeys. I hug and kiss everyone goodnight, wish them “Shalom” and leave. On the way out I notice the 2 wooden mangers that Joseph repaired. They look like new and seem very sturdy. He even cleaned and washed the stone manger and moved the ox to the other side of the outside stable. All seems ready for the arrival of the baby. As I look up I can see the first stars of the night above the western horizon. Hmm… I had noticed in the twilight of this morning that one of the moving stars—the planet the Romans call Jupiter—was hidden behind the moon. But the other star-planets seem to have moved closer together. They are still bright in the sky tonight. Strange, but beautiful. I walk the short distance to our home next door and crawl under my blanket for a good sleep. I barely have the strength to say my night prayers which Father had taught me. I feel so good – and so very sleepy. It feels as if the Spirit of God is upon Bethlehem—it is quiet, calm and peaceful. Traditional, Modern, or New versions. All these LINKS are to YouTube®©. Modern About young King David by Chris Tomlin - Films and Music Inspired by "THE STORY"/ "Your Heart" (DAVID). 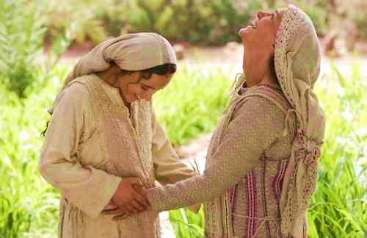 Mary’s prayer upon meeting her cousin Elizabeth is called the “Magnificat” as she praises God for her baby to-be-born. Modern: “Magnificat (All That I Am)” by David Haas Wonderful music with lyrics shown in English and pictorial presentation of works of art. Modern: “Magnificat (All That I Am)” by David Haas – guitar, with choir and instrumentals in background. Inspiring pictures related to his song. 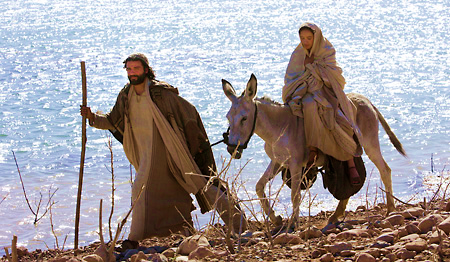 New: Light Christmas Carol favorite for children – “Mary Rode upon a Donkey” by Richard Cootes. Mary, Joseph with donkey meet the innkeeper. Popular Hebrew Song: Shalom Aleichem with English translation ("Peace be upon you") is a traditional song sung by religious Jews every Friday night upon returning home from synagogue prayer. Beautifully presented by Susana Allen & Hector David. Classic Country: "Beautiful Star of Bethlehem" performed by The Judds .Beautiful voices, guitar and pictures on this video. Click Gold highlighted internet LINKS to experience 3-D Tours, Photos, Videos, Maps, Bible References, Food Recipes and additional interesting information. 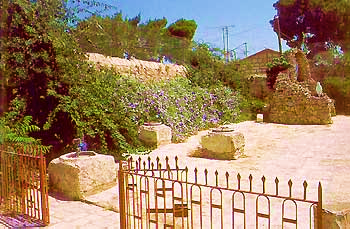 Tour Mary’s Spring: When Mary visited Elizabeth she went to the village of Ein Kerem west of Jerusalem. According to tradition, Mary drank from this spring of water. Tour Ein Karem: birthplace of John the Baptist, and The Visitation site. By BibleWalks.com. Visitation of Mary and Elizabeth - Wikipedia: Mary was a cousin of Elizabeth, who was married to Zechariah. They visited while each was miraculously pregnant." Elizabeth - Wikipedia: She was a cousin of Mary; wife of Zechariah and mother of John the Baptist. Zechariah - Wikipedia: Husband of Elizabeth. He was a High Priest in the Temple of Jerusalem. Note - Different spellings for same name due to translations: Zechariah, Zachariah, Zacharias, Zachary; and Elizabeth, Elisabeth. 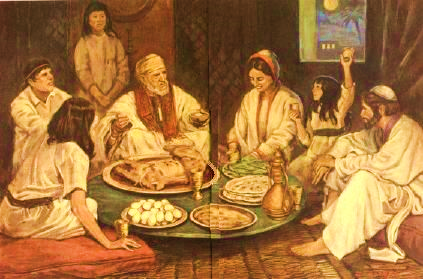 Blessing Bread: by Jewish Online Guides Bread is the staple food of humankind; so, before eating it Jews make a special blessing of Hamotzi, thanking God for bringing forth bread from the ground. English intro, Hebrew prayer, video from YouTube. List of Jewish Prayers and Blessings - Wikipedia: Blessings at meals included. Kosher Foods - Wikipedia:. Foods allowed or disallowed to eat. Plus their preparations. King James Version (KJV) audio recording of text of the Visitation of Mary with Elizabeth and the birth of John, son of Zechariah and Elizabeth. New American Bible - Revised Edition with options for commentary and notes of the Visitation of Mary with Elizabeth and the birth of John, son of Zechariah and Elizabeth. New International Version (NIV) text: Isaac is born of Abraham and Sarah. Everyone laughed that he would be born to such elderly parents, but God said it would be—and it happened. Star of Bethlehem - Wikipedia: Several explanations are summarized as to what this star may have been. Fig. 1. Mary visits her cousin Elizabeth while both are pregnant. They praise God for the miracle of their babies. Fig. 7. 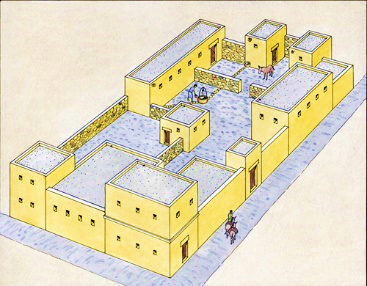 A typical inn (in the Middle-East in Jesus’ time) with buildings arranged around a courtyard. TThis eBook and story is for personal education, non-profit, and “fair use” only, and is not to be used for profit; this eBook is made available free of charge. This website contains no ads. Do not publish or copy any of this material to Facebook, social media, or public file areas. All copyrights are the property of the respective owners of: text, graphics, art works, maps, references, Bibles, articles, tours, and commentary, as well as of electronic information, images, photos, music, videos, dramatizations, audio readings, performances, and movies and all material at LINK sites included herein.